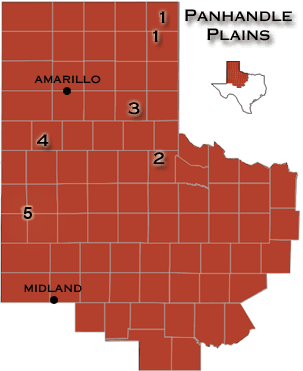 The Panhandle Plains of Texas comprise the southern end of the Great Plains of the central United States. Soils vary from coarse sands along outwash terraces adjacent to streams, to tight clays and shales. Soil reaction is neutral to slightly alkaline. Caliche generally underlies these surface soils at depths of two to five feet. Home to the pronghorn antelope, badger, and prairie dog.